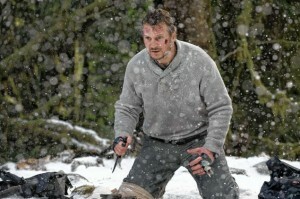 It’s Liam Neeson vs. the wilderness in ‘The Grey’. One of the most surprising and effective survival films of in a long time, The Grey is a nerve-wracking drama that wrings quite a lot from very little while submitting viewers to a glimpse of an icy hell on earth. It’s hard to believe it’s from director Joe Carnahan and produced by Tony Scott, whose respective screamingly over-the-top productions are often the exact opposite of something so nuanced as this. It starts off quietly, with narration by John Ottway (Liam Neeson) via a letter he’s writing to his wife illustrating the depths of his loneliness and despair. Ottway works for an oil company at a remote Alaskan drilling site, where he’s paid to shoot wolves that get too close to the roughnecks, whom he describes as “ex-cons, drifters, fugitives… men unfit for mankind.” Ottway is the epitome of a man dead on the inside, detached from everyone and everything around him. The reasons that he’s been ground down to the point of suicidal tendencies are gradually revealed. When the plane carrying Ottway and others home to Anchorage crashes in the wilderness in a white-knuckle sequence that won’t do much for viewers afraid to fly, Ottway and six others are left in the unenviable position of struggling to survive sub-freezing temperatures long enough to find a way back to civilization. If that were not bad enough, they soon discover they are in the middle of the hunting grounds of a pack of immense timber wolves who quickly begin stalking and picking off these unwanted intruders. Granted it all sounds rote and by-the-book, but Caranahan and screenwriter Ian Mackenzie Jeffers (adapting his short story “The Ghost Walkers”) aim a little higher than just “it’s Taken meets The Edge“. Somewhere around the halfway point the story subtlety switches gears, investing as much into its characters as it does the tense action beats. Caranahan and Jeffers deftly blend a survival thriller with something more existential, as these coarse men begin to face their mortality and the very real and quite likely fact that they’re going to die. As with the rest of Carnahan’s filmography, testosterone runs rampant, with the men battling for alpha male status just as much as their canine counterparts; unlike most of the rest of his work, it serves a purpose here. It’s tempting to say that it’s reminiscent of Ernest Hemingway’s or Jack London’s tales of hard, introspective men whose struggles with a forbidding environment mirror their inner battles. Carnahan and Jeffers invest enough development into their characters to give them depth while avoiding the clichés and easy outs that viewers often expect. There’s an amount of subtlety in The Grey that hasn’t been seen in Carnahan’s work since Narc (2002). The precision pacing never falls apart — its 117 minutes fly by — and it never ceases to be gripping. Cinematographer Masanobu Takayanagi’s grainy photography compliment’s the story with a color palette that jarringly shifts from the warm yellow-orange glow of Ottway’s dreams about his wife to the dreary white snow- and grey mist-shrouded landscape that wants to claim him. Neeson is at his best here as the resourceful, determined, and somewhat paternal hero, and he’s backed by a strong supporting cast that includes Dermot Mulroney, Dallas Roberts, Frank Grillo, and James Badge Dale. The emotions that drive Ottway are palpable, and the hints at lost love can’t help but bring to mind Neeson’s loss of his wife Natasha Richardson three years ago. If the material is Neeson’s way of coping, then the wolves don’t stand a chance. I’ve been llooking forward to this one for some time, I’m glad its getting good reviews. Thanks Gary.